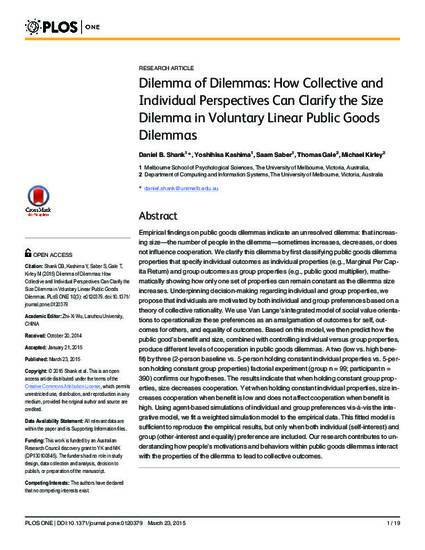 Empirical findings on public goods dilemmas indicate an unresolved dilemma: that increasing size—the number of people in the dilemma—sometimes increases, decreases, or does not influence cooperation. We clarify this dilemma by first classifying public goods dilemma properties that specify individual outcomes as individual properties (e.g., Marginal Per Capita Return) and group outcomes as group properties (e.g., public good multiplier), mathematically showing how only one set of properties can remain constant as the dilemma size increases. Underpinning decision-making regarding individual and group properties, we propose that individuals are motivated by both individual and group preferences based on a theory of collective rationality. We use Van Lange's integrated model of social value orientations to operationalize these preferences as an amalgamation of outcomes for self, outcomes for others, and equality of outcomes. Based on this model, we then predict how the public good's benefit and size, combined with controlling individual versus group properties, produce different levels of cooperation in public goods dilemmas. A two (low vs. high benefit) by three (2-person baseline vs. 5-person holding constant individual properties vs. 5-person holding constant group properties) factorial experiment (group n = 99; participant n = 390) confirms our hypotheses. The results indicate that when holding constant group properties, size decreases cooperation. Yet when holding constant individual properties, size increases cooperation when benefit is low and does not affect cooperation when benefit is high. Using agent-based simulations of individual and group preferences vis-à-vis the integrative model, we fit a weighted simulation model to the empirical data. This fitted model is sufficient to reproduce the empirical results, but only when both individual (self-interest) and group (other-interest and equality) preference are included. Our research contributes to understanding how people's motivations and behaviors within public goods dilemmas interact with the properties of the dilemma to lead to collective outcomes. © 2015 PLOS, All rights reserved.